A Day Dreamer's World: AUTHOR INTERVIEW: Catherine Wilkins! 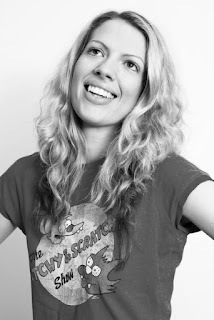 Last week I got the chance to interview comedian and author Catherine Wilkins! Catherine is one of my new favoruite authors because of the way she brings her background as a comedian into her writing. 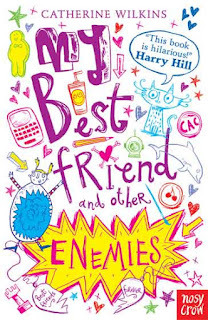 You can take a look at my review of her book 'My Best Friend and Other Enemies' here. Hi Catherine! Welcome to A Day Dreamers World! How long have you been writing? - Well, kind of since I was about ten, writing bits and pieces. That's when I decided I wanted to be a writer. When I was a teenager I started writing a couple of attempts at books that I never finished. When did you decide to finally write a novel and try to get it published? - In my early twenties I decided to try and do it with a lot more focus. I planned it a bit more, I dedicated more time to doing it, and I actually finished it. - My favourite place varies. I used to like cafes but now I find them a bit distracting. I've moved house quite a lot and lived in various rented rooms, so a lot of my writing has been done sitting up in bed with a laptop. But I just got a brand new desk which I'm quite excited about. (I'm writing this on it). So maybe that will become my favourite place to write. Did you enjoy reading as a child? - I loved reading as a child. It was one of my favourite things to do. What were your favourite books? - I really loved funny books and I loved books where the characters went off and had adventures. So Roald Dahl and C.S. Lewis were firm favourites. Is there a book out there that you would love to have been the author off? - There isn't one specific book that I wish I'd written, but there are lots and lots of beautifully crafted lines and ideas that I wish I'd come up with. Maybe the nearest to a whole book I wish I'd written would be the first Hitchhikers Guide To The Galaxy book, by Douglas Adams (although it wasn't written as a book, it was originally a radio series). As well as a children's author your a comedian. Does your career as a comedian help while writing? - This is a really interesting question! Yes - I think it definitely does! Doing stand up comedy makes your comedic writing much sharper. When you test material and it doesn't quite work, you have to re-write it to make it stronger. Getting instant feedback from fifty or so people is much more beneficial than waiting three months for one person to get back to you about how to improve your writing. Also, being on the stand up scene means you end up watching a lot of stand up comedy, so you quickly see if there is an obvious joke that everyone is coming up with, and then you either avoid making it yourself, or try to come up with a more interesting way of doing it, so that you stand out. Over all it makes you more creative, and quicker at spotting what's funny. What's the best piece of advice you've been given while trying to pursue a career as a comedian and author? - (Another really good question!) There are a few gems, but probably the best advice is 'keep going' - it sounds really obvious, but actually pursuing this kind of career can be very disheartening at times. There is a lot of rejection and no set pathway, so it can feel like you're floundering around not getting anywhere. But if you accept that it's not going to be easy, it's much easier to keep going. Other good tips are about finding your own voice, enjoying it and expressing yourself, rather than what you think people want - which I think is extremely important. But you won't be able to do any of that unless you keep going. 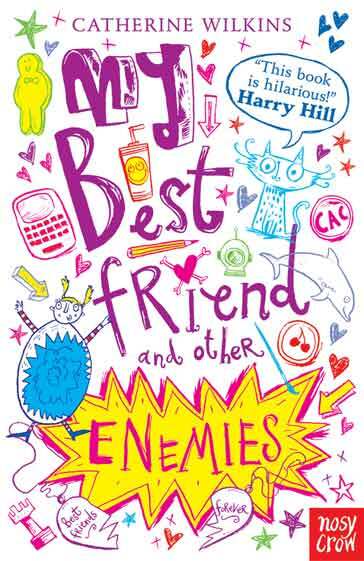 I've read My Best Friend and Other Enemies and I have to say it was great! Where did your inspiration to write it come from? - I think partly I can remember similar things happening when I was at school, and partly I really like the idea of someone like Jessica being the hero. I wanted to write about a character who was a bit of an underdog, but actually doing better than she realised. I like the idea of someone being silly, funny, nerdy and insecure, but still winning in the end. Jessica(the main character in My Best Friend) is a Cartoonist, why did you decide to make this her talent? - I made this her talent because drawing cartoons is something I have in common with Jessica (and they say you should write about what you know). I used to love drawing cartoons when I was younger, and I was quite good at it. I did have people asking me to draw cartoons for them sometimes - but I didn't do the rest of the things in the story that Jessica does with them. Did you help when it came to the illustrations? - I didn't help with the illustrations, (I'm pretty rusty now). But we had a fantastic illustrator called Sarah Horne (http://www.sarahhorne.co.uk/image1.html ) to do them for us. I described some of the things I thought would be good and she came back with illustrations that were better than I could ever have hoped for. They're perfect for the book and I'm so glad we had Sarah to do them. Do you and Jessica share any characteristics? - Yes. Apart from the cartoons, we're both quite silly, cheeky, funny and bad at concentrating. But she isn't me or anything. Jessica is actually a lot more confident than I was at her age, and a bit cooler. I was more shy and less quick to say something funny. I could come up with the perfect thing to say the next day, after I'd written it. If you could be any one off your characters who would you be? - I think I would love to be Tanya Harris for a day. I'm quite shy and polite, so I think it would be brilliant to walk around like you own the place and have people be scared of you. But just for a bit. Are any of the characters in your book based on people you know? - Well, yes and no. Some of them are sort of bits of various people combined, and some are completely made up. I've known a few people a bit like Tanya, Natalie and Amelia, but no one exactly like them. Was it the first book you wrote? - It wasn't the first book that I wrote. A few years ago I wrote another book for slightly older teenagers that was in with a publisher and then kind of ended up in limbo. It's not impossible that something could still happen with it, but I think I'd need to re-write it first. Have you got any plans to write a sequel, or any other books? - Yes, the plans for the sequel are afoot and I'm currently working on it. I love these characters and I have lots of ideas for them to carry on going, so it would be lovely if that happened, but we'll see. I have lots of ideas for other books as well. I would love to just carry on until I've written them all down. Your latest release is My Best Friend & Other Enemies. Where can we find more information about the it and where to purchase it? A big thank you to the fantastic Catherine Wilkins! I love all your answers, thanks for taking the time to answer all of the questions so fully and honestly. Great interview! I just wish I'd thought of asking her first! *jealous glare* When are your competition winners going too be announced? Great interview! There are soo many questions! Well even though I've voted for Harry Potter my joint fave series is the hush, hush saga by Becca Fitzpatrick. Also I'm running a writing comp. So if you'd like to enter... No pressure! Thank you! I just get carried away with my questions! I'll take look at the Hush Saga, I think I've heard of it before. Of course I'll enter! The results of mine will be up on Saturday! Thoroughly enjoyed reading the interview, it was brilliant. A real treat. Really impressed!